Ok I’ll admit it. I don’t love pumpkin. I don’t race out to Starbucks as soon as they start making pumpkin spice lattes. I don’t drive like mad to my local beer store to grab the latest pumpkin flavored IPA. I like the occasional pumpkin muffin or cupcake, and pumpkin pie is a must on Thanksgiving. I do enjoy pumpkin soup; ok fine I like pumpkin quite a bit. I like it, I just don’t love it. Recently C asked me to make scones. My girl loves a little something sweet for breakfast which I allow more often than I probably should. 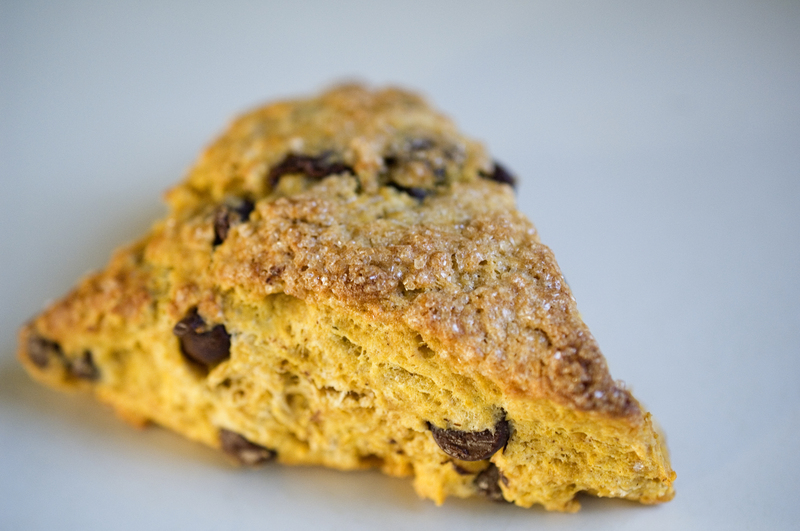 While trying to decide which type of scones I should make, I came across a recipe for pumpkin scones on King Arthur’s website that looked easy and tasty. I went for it and I’m glad I did because both kids and Bubba loved them! These scones have a nice crusty top which I contribute to the raw sugar I sprinkled on top just before popping them into the oven. The crumb is moist, not dry like some scones. The chocolate chips work well with the cinnamon, nutmeg and ground cloves, and best of all: the pumpkin is not overpowering which I love. The batter comes together very quickly so making them first thing on a weekend morning is no trouble at all. 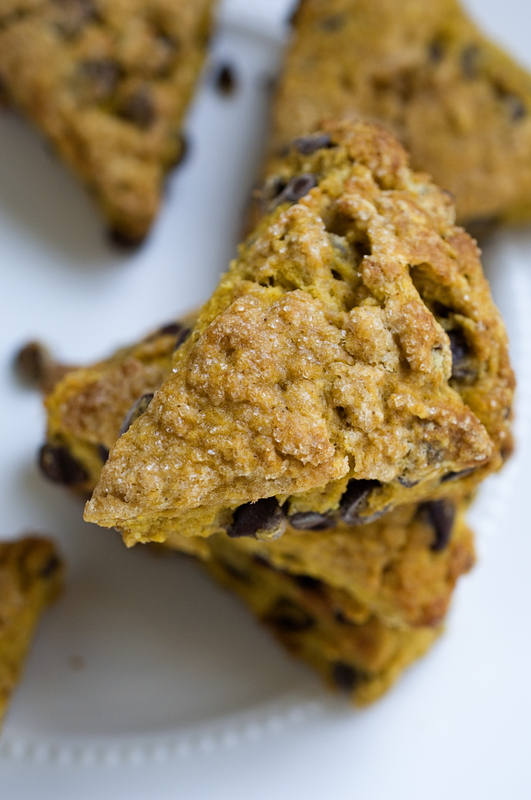 Make these scones, invite a friend over for coffee, chat and relish in the praise! I used mostly all-purpose white whole wheat flour. Also, instead of all-spice I used cinnamon, nutmeg and ground cloves. I think the addition of orange zest would work nicely here but I didn’t have any oranges in the house. Next time! Whisking the dry ingredients together helps to aerate the flour. 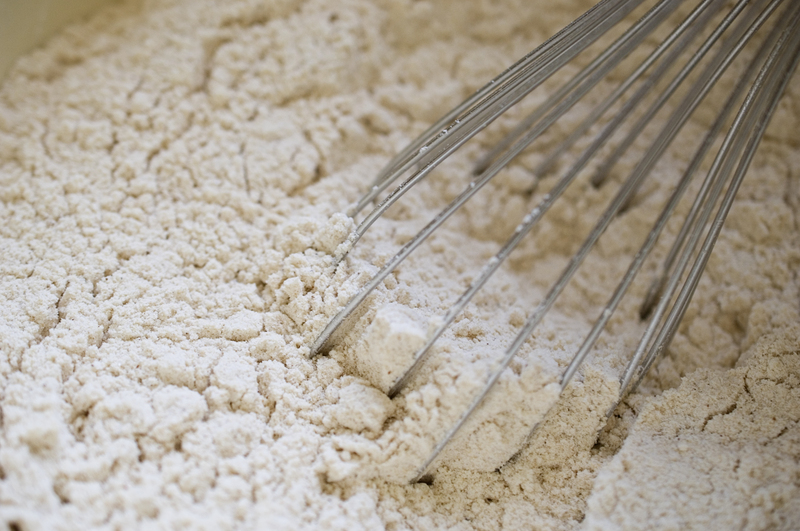 Joy the baker has a super helpful post on her blog about sifting flour. Check it out! 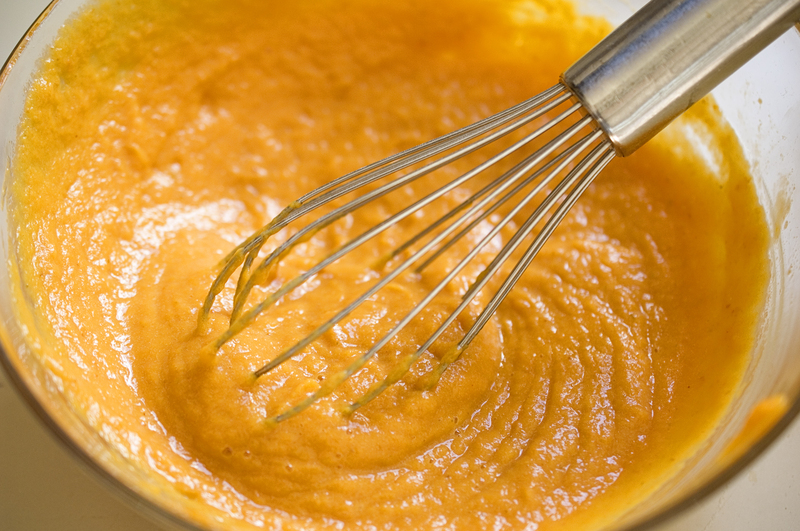 Whisk together the pumpkin puree and eggs until smooth. I love that bright orange color. Very cold butter is a must for scones. I grated the butter and then added it to the dry ingredients for a more even distribution. Combine the butter and flour with your hands. It is ok if you see small lumps. After you add the pumpkin/egg mixture to the dry ingredients; mix together until the dough is moist and comes together. I found it easiest to do this with my hands. Separate the dough in half and form each half into a round 5 inch circle. Brush with milk and sprinkle with raw sugar. Cut each circle into 6 triangles and pull apart gently. You will end up with a dozen scones. For the best texture and rise, place scones in the freezer for 30 minutes before baking. 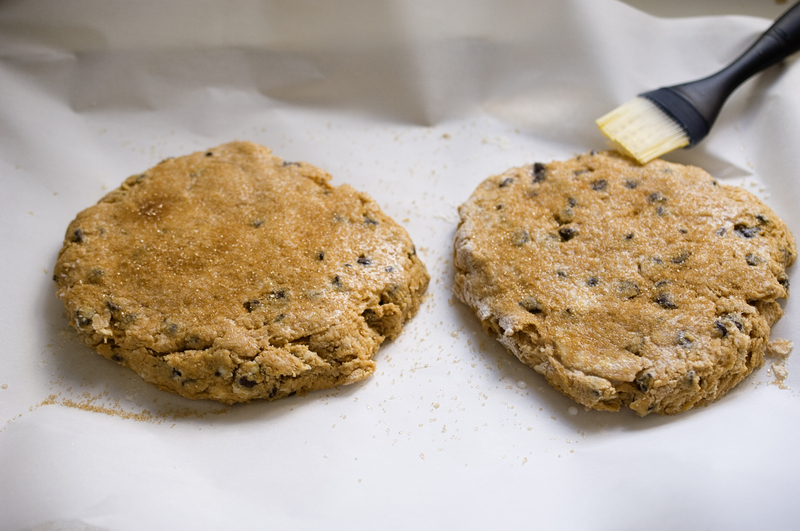 Pre-heat your oven to 425 while the scones are chilling. Bake for about 25 minutes but start checking them around 22 minutes. The scones are done when a toothpick inserted in the middle comes out clean with no wet crumbs. Serve warm or at room temperature. Scones are best the day they are made. Enjoy! 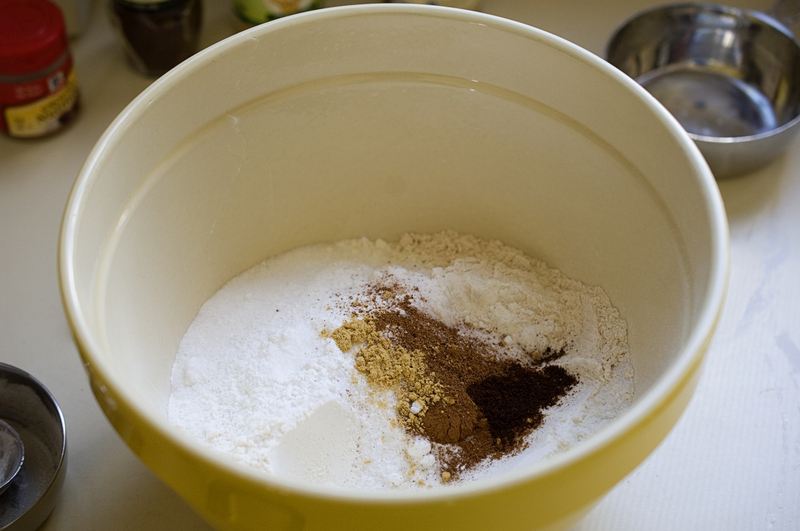 In a large bowl whisk together flours, sugar, baking powder, salt, cinnamon, nutmeg and cloves. 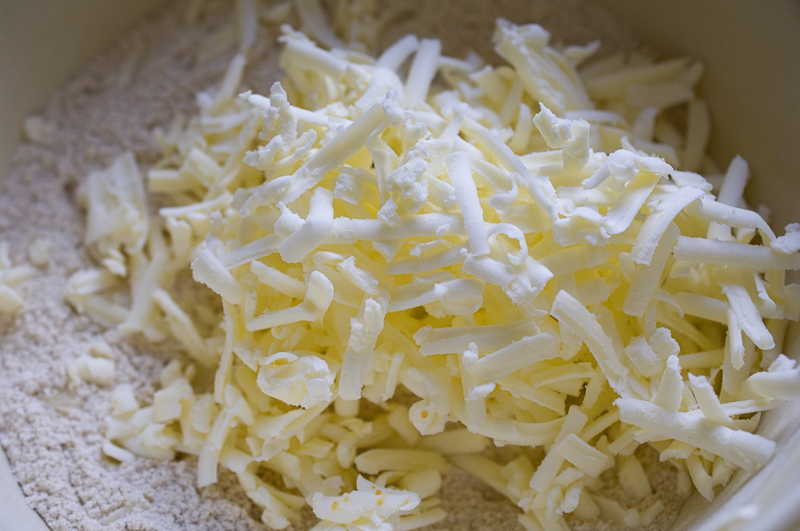 Grate the cold butter and mix it into the dry ingredients until it appears crumbly. Set aside. In a separate bowl whisk together the pumpkin puree and eggs until smooth. Add the wet ingredients and 1 cup of chocolate chips to the dry ingredients and mix until the dough is moist and comes together. Line a baking sheet with parchment paper and sprinkle a bit of flour on it. Place dough on parchment paper and divide in half. Form each half into a 5 inch rounded circle. Brush milk on top of each half and sprinkle well with raw sugar. Cut each circle into 6 triangles. 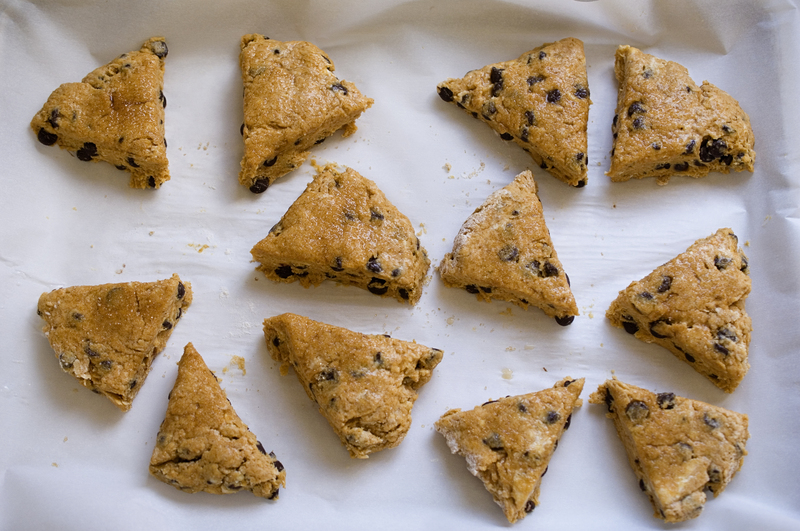 Gently pull apart the triangles so some space remains between the scones. Pop into the freezer for 30 minutes. Pre-heat your oven to 425 and bake the scones for about 25 minutes. Start checking the scones at 22 minutes. The scones are done when a toothpick inserted in the center comes out clean with no wet crumbs. Serve warm or at room temperature. They taste best the day they are made. If for some reason you have leftovers; store in an air tight container at room temperature for a couple of days. Enjoy! I love soup all year-long, but here are 5 fall soups that are a must try. This is my favorite sweet potato soup. It is super healthy and hearty which makes for a perfect fall meal. Serve it with warm crusty bread. I made this butternut squash soup last year for G’s birthday party and everyone loved it. It has a nice kick to it! When chicken soup is necessary to get over a cold, try this healthy recipe. I love chili and can’t wait to try President Obama’s recipe. I make this bean and chicken soup several times a year. Bubba loves it and hopefully someday the kids will too!